Relaxing walks around our Suffolk farm. Luxurious yarn and fibre products. Take a leisurely guided walk among the farm fields. 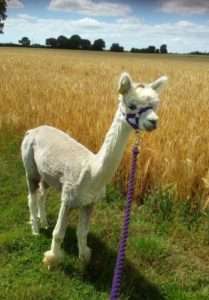 So that you can enjoy the walk and get to know your alpaca we only take up to four alpacas at a time. The leisurely walk is about a mile and your visit time about an hour and a half. 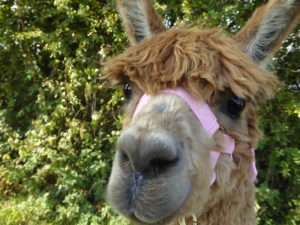 This includes a chat about the boys and their fibre and a chance to feed the alpacas. Suitable for everyone over 8 years old. One person leading each alpaca with up to one adult or two children over 8 accompanying. Please call is if you have a slightly younger child and you feel that they are confident enough to join the walk. Walks available Tuesday, Wednesday, Thursday and on Saturday - 10am or 1.30pm (10am only in the summer months). Please book in advance. Come and meet our boys. 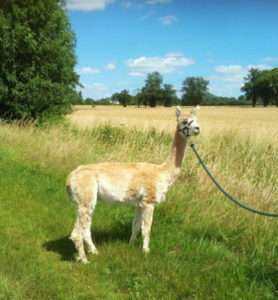 Find out more about alpacas, help us to feed them and learn about the special qualities of their beautiful fibre. Suitable for everyone, including younger children. 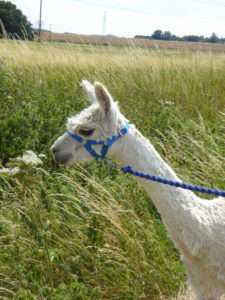 Meet the alpacas available Tuesday, Wednesday, Thursday and on Saturday - 10am or 1.30pm (10am only in the summer months). Please book in advance. Visit the alpacas every day! Between May and September you can stay on our eco camping and glamping site here on the farm. Click the green icon above to visit our Lings Meadow camping website. 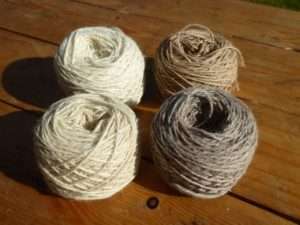 Buy luxurious 100% alpaca yarn for your crafting projects. 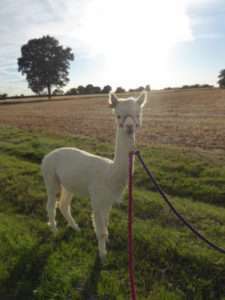 If you would like to come and shop for yarn, raw fibre or products just give us a ring or email alpacas@lingsmeadow.co.uk. We are very happy to introduce you to the boys whilst you are here. Or come and see us at Wyken Farmers' Market on the fourth Saturday of each month. Alpacas are curious, friendly, and endearing animals. They produce luxurious fibre each year, which is hypoallergenic, soft and warm. They are also gentle on the land. 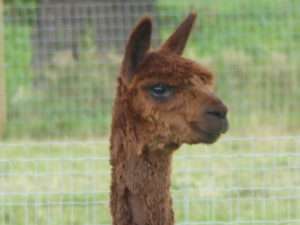 We currently have a team of 8 alpacas of various ages. Each brings his own special qualities to the group. Sky is a stunning Rose Grey Huacaya. He has the finest fibre on the farm. His sight is not so good in one eye, so he prefers to stay at the back of the pack and follow. Sting is a white (most of the time!) Huacaya. He has beautiful fibre and is a favourite with our younger visitors. He doesn't go out on walks as he may have early arthritis. Fabian is possibly our largest Suri boy, but is a real sweetheart. He can be shy at times but likes to join in with the others. Gem is our littlest Suri alpaca, and is learning the ropes. His fibre has incredible lustre. Best friends with Genesis. Dakota is the newest member of our team. He has made himself right at home and is a very friendly alpaca. Please leave a message if we are not in, and we will get back to you!